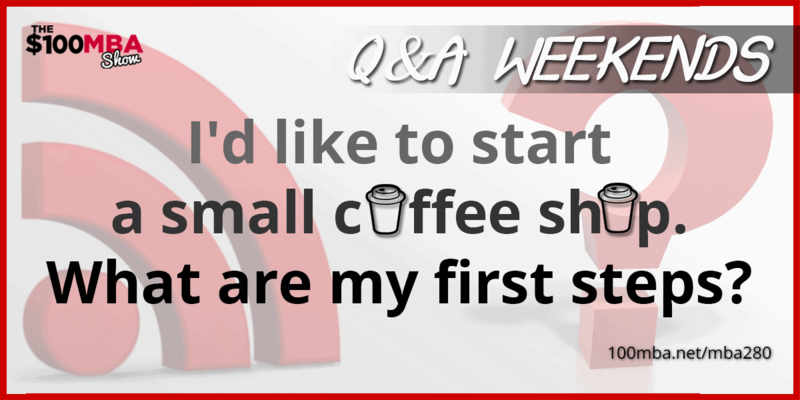 Q&A Weekends: I'd like to start a small coffee shop. What are my first steps? MBA280 Q&A Weekends: I’d like to start a small coffee shop. What are my first steps? Today we answer a question from one of our listeners. She wants to know how to start a small coffee shop business. Listen to the episode and learn strategies on how to wisely take your first step! Click Play! « Previous Post MBA279	How to Find Great Teachers Plus Free-Ride Friday! Next Post » MBA281	Q&A Weekends: Is starting a business around faith or spirituality a bad idea?